There is something creeping and crawling on your iPhone. HEXBUGS have found their way to your iDevices. The new free to play, HEXBUG Havoc, allows HEXBUG fans a new way to play with their favorite creatures. At the start of each mission, players choose their own Nano V2 before exploring their way through endless horizontal tracks and vertical tubes filled with collectibles, power-ups, obstacles, and enemy HEXBUGs. Players will need to travel fast and far to unlock new track pieces, complete missions, and confront electrifying surprises around each and every turn. 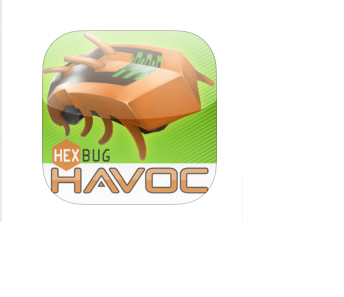 HEXBUG Havoc players can access the app through Game Center, challenge their friends, and post their scores to Facebook and Twitter. HEXBUG Havoc can be played on any of the following devices: iPhone (4 or later), iPad (2 or later), iPad Mini, and iPod Touch (4 or later).